Defending champion Neil Wright beaten in the first round of the Hunts two-bowl singles. 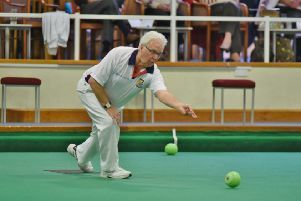 Geoff Staggs of Whittlesey manor has been the surprise package of the Hunts two-bowl singles competition. Staggs has knocked out Middleton Cup players James Harford (Parkway) and Toby Furzeland (Sawtry) en route to the last eight. The competition gets tougher now though as international trio Tristan Morton, Simon Leader and Nicky Brett, are still standing. Defending champion Neil Wright (Parkway) didn’t make it past the first hurdle this time, losing to club colleague Stuart Reynolds. Both the defending champions in the Northants Bowling Federation’s major singles competitions lost their crowns in the opening round. Graham Agger (Yaxley), who reached the national four-bowl singles final last year, was beaten 21-18 at West Ward by Jim Ruddy, while Andrew Thurston (Parkway), the defending two-bowl singles title holder, went down 21-14 at Peterborough & District to Wilf Redhead, and was also beaten in the four-bowl event by his father, John. Another surprise in the two-bowl competition came with the 21-9 defeat of former national champion Adam Warrington (Blackstones) at the hands of Mick Leighton (Langtoft Pearl). Hunts men have weekend battles with neighbours Cambridgeshire in three different competitions. They clash in the Eastern Counties League at Somersham on Saturday morning, before heading to Parkway for an afternoon meeting in the Balcomb Trophy, the national inter-county two fours championship. The junior equivalent is being staged at Parkway the following day when under 25 players from the counties bid for a place in the regional finals being hosted by Whittlesey Manor on June 14. Balcomb Trophy team: Brian Martin (Parkway), Ed Elmore, Lewis Baker, Nicky Brett (all Warboys); Simon Leader, Rob Elmore (both Warboys), Mike Robertson (Parkway), Tristan Morton (Warboys). Eastern Counties League team: Keith Thomas (Yaxley), Alan Parish (Somersham), Ian Stocker (Eynesbury), Ray Keating (Parkway). Tom Hall (Eaton Socon), Sam Nickerson (Sawtry), Harry Ward (Hemingford), Joe Randall (Parkway). Toby Furzeland (Sawtry), Simon Irwin (West Ward), Ross Martin (Warboys), Kierran Murray (Brampton). Paul Dalliday (Whittlesey Manor), Trevor Murray (Brampton), Owen Kennedy (Hemingford), Robbie Coleman (Brampton).Howard Shipp, Neil Wright (both Parkway), Tom Swannell (Sawtry), Simon Law (Parkway). Steve Farrant (Huntingdon), Phil Swannell (Somersham), Eric Baker (Papworth), Ian Swannell (Somersham). Local bowlers head to Leamington this weekend to bid for places in the England junior men’s and women’s international teams. Joe Randall (Parkway) is included in the men’s trial along with Hunts colleagues Harry Ward (Hemingford) and Edward Elmore (Warboys). If successful they will attend a squad training day at the same venue on July 5 after which the team for the British Isles Under 25 event in September will be selected. Hannah Overton (Parkway) will be hoping to retain her place in the women’s team which will be defending the title in Scotland in the summer. The players selected from the trial will attend a squad training day before the team is finalised.